We were tracking a couple of stocks and an ETF that we put on bottom-watch heading into the end of last week, and are happy to report that we’ve seen the beginnings of some nice rebounds on those fronts. We tagged this linked pair on Friday, noting that one is a publicly-traded wholly-owned sub of the other, and that the chart patterns were virtually identical. Traders could have latched on to either, and witnessed the reversal we called for on the charts. The move for the parent, LINE, was recorded as a run from 2.73-3.83, a 40% intraday swing. The subsidiary, LNCO, ran 34% from 2.46 to 3.29. Both very respectable single-session moves. We’ll continue to monitor all three of these plays for the possibility of continued uptrends as we kick things off this week. 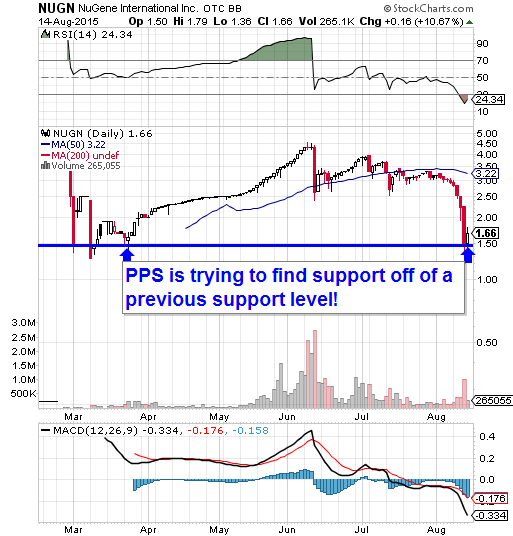 We’ll look for each one to register higher lows, building a higher base of support than we witnessed on Friday. In the video chart we drew up for PZOO in that report we mentioned we wanted to see a break of the 50DMA (.0061) and we’ll look for the stock to maintain support at or above that level on any pullbacks. The next area of key resistance crops up at the 200DMA of .011. The company had a conference call last week (>>>Read Transcript or >>>Listen to Call) which went over a vast array of important topics. We suggest taking the time to go over that; highlights included financial and share structure data, as well as information regarding all branches of the company’s rapidly expanding marijuana testing business. Setting off our abnormal volume scanner this morning was MDCO, which looks ready to fly with un-traded upon news regarding a cholesterol study hitting the wires on Sunday. The stock is up considerably in the premarket, so we’re going to formulate a potential quick-hitting options idea for intraday/intraweek flip opportunities- We’ll be looking for the possibility of dip-and-rips in the range of MDCO Weekly $38-41 Calls. We’ve got a couple of stocks that we’ve been tracking this summer coming out with noteworthy press in the early hours this morning, we’re going to want to increase our alertness level for each of them as we kick off a new trading week. NuGene International, Inc. NUGN - NUGN is appearing in the news feed with a substantial revelation at an opportune time this morning. The stock took an absolute beating last week, and just began to find its footing off of a previous support level on Friday. At the moment the stock is extremely oversold. Coupling that with the addition of this morning’s PR announcing the company’s Q2 revenue growth of more than 150% over the prior year, conditions could be just right for a rebound. We’ll be on a sharp lookout for that possibility. AVEO stock is gapping up immensely in premarket trading on the strength of a deal the company just announced with Novartis. 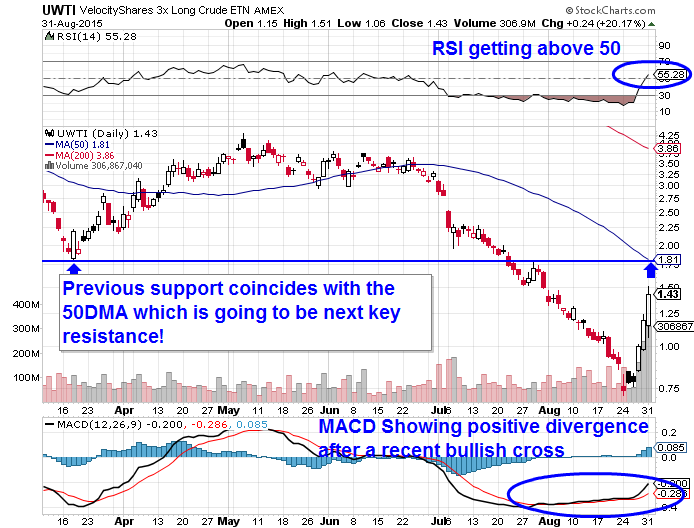 The potential for both a momentum play and/or a bounce play is elevated. We’ll need to see it maintain support at or above 2.20 (a previous resistance point) on any pullbacks to remain interested. With high profile news like this, it’s quite possible that it will do so. We’d like to submit a potential options trading idea to start the week. Morgan Stanley has raised their price target on the stock (Currently valued in the mid-$250′s) from $280 to $465, and TSLA is gapping up on the heels of that announcement. As a result, we see the potential for some intraday and/or intraweek trading opportunities in the range of TSLA Weekly $250-265 Calls. BIOC continued to roll for the third straight day yesterday since we tagged the play in Monday’s extended watchlist. We witnessed a trading ramnge from 3.90-4.91, which marked an intraday move of 26% on nearly 12x its monthly average volume. Calculated from the low of 1.71 which we observed on Monday, yesterday’s high represented an overall increase of 187% in a span of just three sessions. We added EYES into the mix in Tuesday’s report, and it too continued to trend up yesterday. The stock traded in a daily range from 11.25 to 14.75, a healthy 31% intraday run. From our observed low of 9.55 on Tuesday, yesterday’s high was equal to a 54% session-over-session move. Yesterday we received word of the approval from a U.S. Bankruptcy Court judge to auction off roughly 2,000 RadioShack stores, with an initial bid of $200M having been entered by the Standard General hedge fund. We’ll be interested to monitoring RSHCQ as events continue to unfold in coming weeks. We watched as BIOC set new highs for the second day in a row yesterday. After gapping up in the premarket, the stock came down slightly to bounce off of support at 2.62 before running as high as 3.60 later in the afternoon. That 37% intraday move came on over 31x the 3-month average volume, and the high represented an overall rise of 110% over our observed low of 1.71 on Monday. Calculated from the premarket high so far this morning (4.20), that figure is extended to a 145% increase overall since Monday. EYES performed nicely for us after appearing in yesterday’s extended watchlist. It saw its low of 9.55 shortly after 10AM, and built steadily throughout the session, reaching its daily high at 11.64. That was good for tidy gains of up to 21% on the day on extreme heavy volume, and like the previously mentioned play, the stock is gapping up in premarket trading today. It’s possible that we’ll see similar action as the session kicks off this morning with yesterday’s momentum driving the gap-up, followed by another potential dip-and-rip scenario. Chegg, Inc. CHGG was another mention from yesterday’s watchlist that ended up faring well with an early low of 7.44 followed by a steady uptrend throughout the day. The run topped out at 8.71 just prior to the close, marking a respectable 17% increase. Matching that intraday gain with a 17% move of its own was Cytori Therapeutics, Inc. CYTX, trading in a range from .70-.82. on 10x the 3-month average volume.